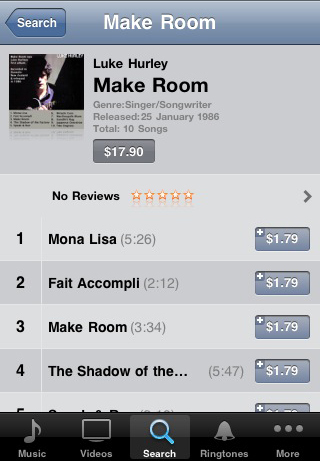 At last the Make Room album from 1986 is now on iTunes (NZ link also on other iTunes versions but link may be slightly different.) Screenshots are below. Update: No longer on iTunes but see bandcamp. Buy a single song or the whole album. Make Room includes the now famous tracks Mona Lisa & Fait Accompli but you should listen to Gandhi’s Rag and MacDougalls Blues which haven’t been out there for 24 years now! It would be great if regular iTunes users could add some reviews there and share this update on Facebook and elsewhere like Amazon. PS. It was Lukes birthday on August 31. Feel free to buy this album of the Live album released last week to celebrate with him.